Heat gas grill to 250°F. Soak wood chips as directed on package; drain. Place wood chips on sheet of heavy-duty foil; fold up all ends to enclose chips. Poke holes in foil with knife; place on grill. Heat about 30 minutes or until chips are smoking slightly. Turn off one side of grill (as for indirect heat). Meanwhile, pat turkey with paper towel. Brush with oil; sprinkle with barbecue seasoning. Place wood chips and turkey on nonheated side of grill. Smoke 3 to 3 1/2 hours, turning 3 to 4 times, until juice of turkey is clear when thickest part is cut to bone (165°F). Increase heat on grill to 350°F. Place turkey on direct heat side of grill. Cook 6 to 7 minutes longer, turning 2 to 3 times, until slightly crisp. For soy-honey glazed turkey drumsticks, stir 1 tablespoon soy sauce, 1/2 cup honey and 1/4 cup packed brown sugar until well blended. 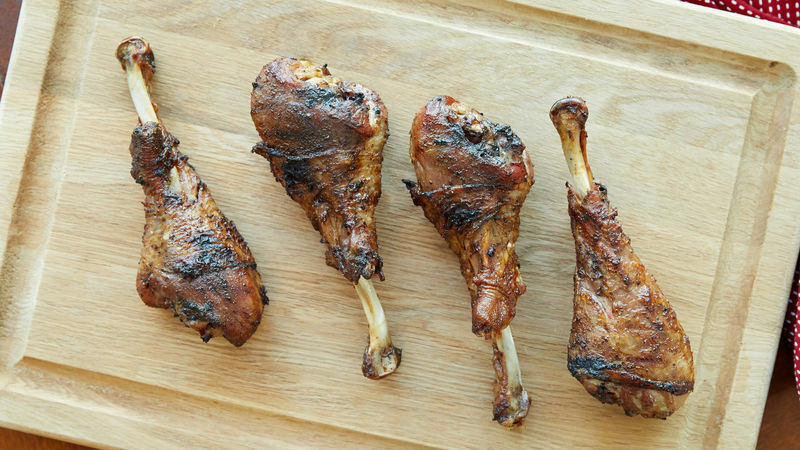 Brush glaze on turkey drumsticks, and cook as directed in steps 2 and 3. Substitute your favorite wood chips for the hickory wood chips in this recipe. Substitute your favorite rub for the barbecue seasoning.